New York City FC drew 2-2 with Toronto FC on Sunday in the first game of the season at Yankee Stadium. In his first home game as NYCFC coach, Patrick Vieira decided to change the defensive shape. As opposed to NYCFC’s close 4-3 win over Chicago Fire the week before, his team employed a back three, with two central midfielders in front of the defence. Toronto’s Greg Vanney made only one change. He replaced Daniel Lovitz with Marco Delgado. In the absence of Jozy Altidore, Jonathan Osorio played on the left side, next to centre-forward Sebastian Giovinco. Both teams preferably played long balls in the build-up, without having any ambitions to move the ball down the middle via ground passes. The hosts usually started their build-up play with a short pass to one of the wider positioned centre-backs who then hit the ball down the line. Andrea Pirlo who stood right in front of the back three, sometimes dropped back which created a situational back four with Pirlo as the left-sided centre-back. This was somewhat unsurprising, because Giovinco closely covered his fellow countrymen, which forced Pirlo to move back to pick up the ball without being pressured. Unfortunately for the hosts, that caused a lack of connection between the first and the second line. Once the ball reached the next level, it appeared that NYCFC’s attacking midfielders consistently switched positions and changed the structure of their line. For instance, Mix Diskerud looked like a right-winger at first, but became an auxiliary striker in the right half-space after a few minutes. In response, Khiry Shelton stayed close to the side line to tie the opposing left-back to the wing zone, which stretched Toronto’s defensive shape and opened the gap between left-back and centre-back at times. On the other side of the field, Tommy McNamara often drifted inside out. In cooperation with left-winger Tony Taylor and David Villa who frequently moved to the left side, the trio overloaded the left flank. In particular, Villa’s motions to the left were very effective. In the 12th minute, he set up the cross that led to a Shelton chance, NYCFC’s first attempt on goal. 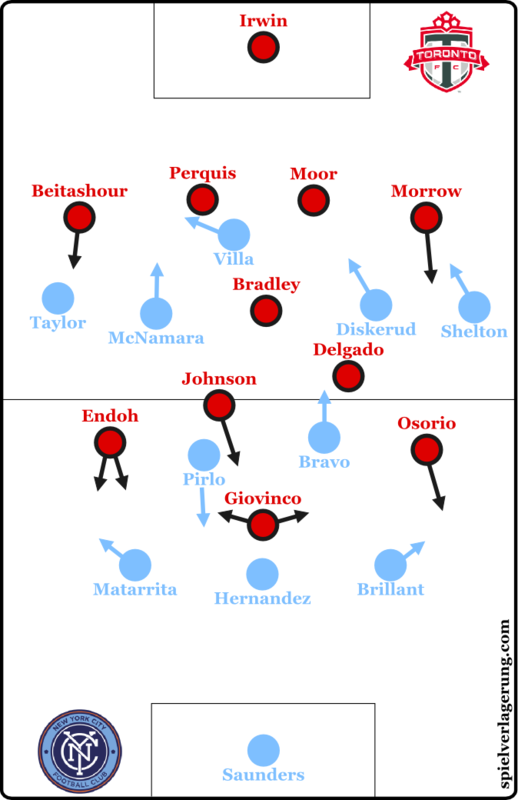 Moreover, Villa displayed a great first touch and quick turns to escape his marker, Michael Bradley, after the Spanish forward received the ball. As mentioned, Diskerud became a second striker, as he intended to fill the hole in the middle when Villa drifted to the left. It was an effective group tactical mechanism that emphasized Diskerud’s spatial awareness. In between the opposing lines, the 25-year-old was able to receive a couple of long passes and to protect the ball for a few moments afterwards. Meanwhile, Federico Bravo, the Argentinian midfielder who was fielded alongside Pirlo, moved a few yards forward to protect the space behind Diskerud and to be ready for possible counter-pressing attacks. Although Toronto won their first match of the season against NYCFC’s city rival, New York Red Bulls, Greg Vanney’s side seemed to be very cautious in the first 45 minutes. In defence, they sat comparatively deep, using a 4-5-1 shape with Giovinco upfront. As the Italian forward usually marked Pirlo, there was normally no pressure on the hosts’ centre-backs. The ball-near winger sometimes rushed forward with the intention of shutting down the vertical passing lane, but that didn’t lead to any turnovers. Meanwhile, Will Johnson, who often was Toronto’s no. 10 when his team were on the ball, dropped right next to Bradley to compress the central space. Toronto’s match plan clearly included a conservative defensive structure that should keep the opponents away from the own penalty box. However, not only were NYCFC able to play precise long balls thanks to Pirlo, they moreover positioned enough attacking players between the lines and at the corners of the opposing 18-yard-box to exploit Toronto’s weaknesses. As they couldn’t close the gaps in the back line effectively, Villa in particular sneaked in between the opposing defenders quite often. Plus, after turning the ball over, Toronto usually had problems to shut down the zones next to Bradley. It took a moment before every player got into position, which left areas within their formation exposed. 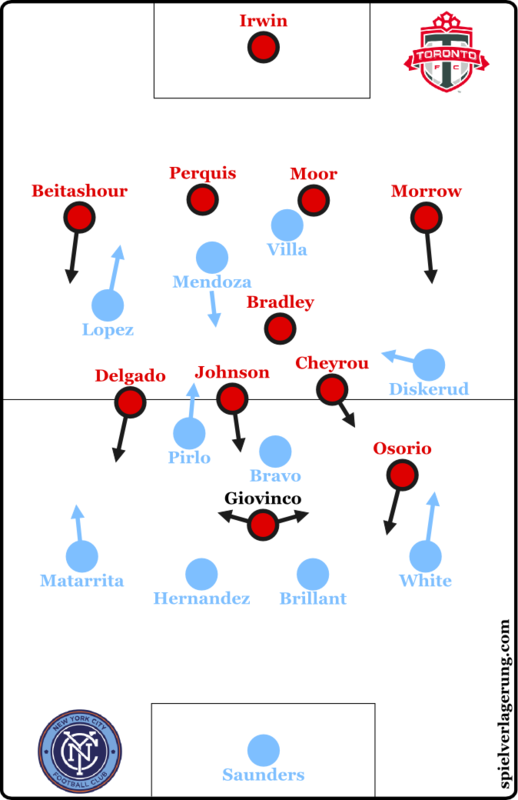 In the 24th minute, NYCFC capitalised on overloading the left side and the holes in Toronto’s defensive shape, as Pirlo and Diskerud moved the ball through a pocket in the left half-space. McNamara then was tripped by Delgado just inside the corner of the box. Villa scored on the following penalty kick, and he added another four minutes later for a 2-0 lead, when Toronto had several failed attempts to clear a free kick, Villa appeared to use an extended arm to control the ball. It wasn’t called and the Spaniard sent in his second goal of the day. Until later in the first half, Toronto didn’t do much of anything offensively. It was hard to identify any possession-based structures, as they only waited to hit NYCFC on the break. As mentioned above, Johnson looked like a no. 10 who was supposed to support Giovinco in the middle. Toronto often played diagonal passes towards the wingers in the early build-up of attacks. Therefore, the wingers were trapped at the side line or were only able to play backward passes, so they didn’t lose the ball. While NYCFC had enough players in the middle due to their tactical shape including a back three, the guests didn’t know how to break in the opposing formation until the 43th minute. Then they displayed their first well-conceived attacking play, as left-back Justin Morrow played an effective diagonal ground pass. His pass found Giovinco in the middle who then played a one-two with Johnson whose shot went wide. A few moments later, Toronto got one back in first-half stoppage time when Damien Perquis was unmarked at the six-yard-box and he got a sliding touch on Giovinco’s free kick. NYCFC, seemingly unshaken by Toronto’s late goal before the interval, started the second half playing a few accurate cross-field passes against Toronto’s more aggressive defence. Vanney had slightly changed the shape, as Johnson now constantly played as a no. 10. As a consequence, he could mark Pirlo, while Giovinco and both wingers rushed forward to put pressure on the opposing centre-backs. Both wider centre-backs in particular had problems with this kind of man-marking scheme. It led to them moving the ball through deeper zones hastily. Pirlo tried to help when he dropped back. But the Italian playmaker was forced to play risky lateral lob passes due to the immense pressure from Toronto. On the hour mark, Vanney decided to mix things up, when he brought on Benoît Cheyrou for Tsubasa Endoh, changing the formation into a 4-3-2-1, with Johnson playing alongside Osorio behind Giovinco. While Cheyrou roamed through the left half-space most of the time, Delgado frequently switched between central midfield and the right flank. Although Toronto took more risks, their attacking rhythm remained odd until the 70th minute. Due to a high amount of long balls and lob passes and therefore a lack of precision, their attacking plays couldn’t create a much-needed flow. In the final phase of the match, the guests began to use more ground passes to bypass the opposing pressing line quickly. And the equalising goal in the 76th minute showcased their effectiveness in the build-up play, when using combination plays instead of easily defendable long balls. Toronto started an attacking play on the right side. They moved the ball diagonally and gained space immediately, entering the final third of the pitch. Giovinco received a cross-field pass, and started to dribble towards the opposing goal, while being not challenged by the defenders. He needed a few touches to split the three defenders in front of him and then was able to roll in a shot from distance. Afterwards, Vieira returned to the back four when he replaced Shelton with right-back Ethan White. In the meantime, Toronto moved back to their initial 4-3-3 shape. In NYCFC’s new 4-4-2 formation, Pirlo was asked to charge forward more frequently. Diskerud played on the right side, but didn’t make many runs upfield, as he intended to support Pirlo in the middle of the pitch. In contrast, left-winger Mikey Lopez, who had been sent on in the 77th minute, waited near the offside line and between right-back and centre-back to pick up long balls or crosses. While Toronto clearly controlled the match at the end, the hosts, in desperation mode, attempted to move the ball straight towards the opposing goal. Neither of the teams had a final punch, though. An interesting duel between two ambitious teams, although Toronto waited until the second half to show their ambitions, ended in a draw. Thanks, Ollie. Wish you success in your exam!